How can you ratchet up your promise? How can you leave your competitors in the dust? How can you make your readers, listeners and viewers reach for their wallets quickly? Simple. Just show them how your product will change their lives. Think. How can your product or service benefit their lives? What is the main promise of your product? How can that promise change your prospects’ lives for the better? Not only chunk up the benefit, future pace it. How will your prospects benefit over time, the long haul? Look through your competitors’ marketing materials, their brochures, their websites, etc. What is missing from them? What’s not quite right? For example, service sellers, like real estate agents, tend to stress features or make vague promises (“The most forward thinking, internet wise, experienced Realtors who can efficiently service all your property needs!“); Internet marketers tend to be phony (“Who Else Wants to Explode Their Profits 376% With This One Amazing Secret!!!“). How can you stand out from the mediocrity? In 1929, at the start of the Great Depression, Jessel Cohn started the Acme Shoe Company, mainly dealing in the manufacture of children’s shoes. 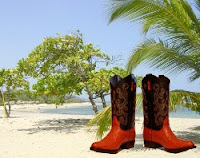 He soon realized there was bigger money in cowboy boots, and even bigger money targeting the affluent. He changed the company’s name to Acme Boots and started his direct response and lead generation advertising. Here is the copy for a pricey pair of boots that went out on his direct mail postcards. “These fine cowboy boots were made by Acme Boot Manufacturing Company and are priced at $3,500.00. The leather is from the hide of the Grand Champion steer, T.O. Pride, sold at auction for $44,375.00, highest price ever paid for a steer. These colorful boots are rich in hand tooling and are trimmed in gold. Imagine the impression you will make, and the heads that will turn when you walk into the club wearing these quality boots. They are sure to bring you a lifetime of enjoyment and style. On the other side of the card was a color drawing of the boots. Note the great USP, the implied scarcity, and the benefit of the benefit (impressing others). In the 1940s, Acme Boots became the largest maker of cowboy boots and remained the world’s largest until the mid 1980s. And the Acme Boot Company is still around; they were purchased by H.H. Brown, a subsidiary of Berkshire Hathaway just a few years ago. There is another important lesson here: it’s vital for companies to continue their advertising during a depression or recession. Here’s an interesting post on Google Answers: Successful Companies and Industries During the Great Depression if you’d like to find out more on how companies can thrive during economic downturns. Here’s Scientific Proof You Need Proof in Your Advertising.